Taxi tip seat advertising is a great way to get your message across to a mostly captive audience. Campaigns are generally much shorter time frames than full livery, although they can run for many months alongside outside branding of the taxi. It can be an extremely affordable solution for companies to reinforce their brand awareness. It can also be used to run targeted promotional pushes for a specific event or product. With the average taxi journey across the UK being more than 3 miles long, you definitely have the time to capture your audiences attention. Tip Seat advertising can also be a welcome distraction for the commuters. What can you advertise on a Tip Seat? From brand awareness to recruitment drives, tip seats can supply you with an opportunity to directly target potential consumers. Whether it be web addresses, company graphics or specific products, its a great way to engage with customers. Who generally travels in Taxis? The majority of taxi travellers fall into the ABC1. A, B and C1 demographic. These are the highest three social grades in the most commonly used classification. Media companies frequently use the proportion of their audience in these grades as a measure of the affluence of their audience — and therefore the attractiveness of the audience to advertisers. As the ABC1 middle classes now outnumber the C2DE working classes by four to three, it is an extremely valuable option for businesses to utilise Taxi tip seat advertising. 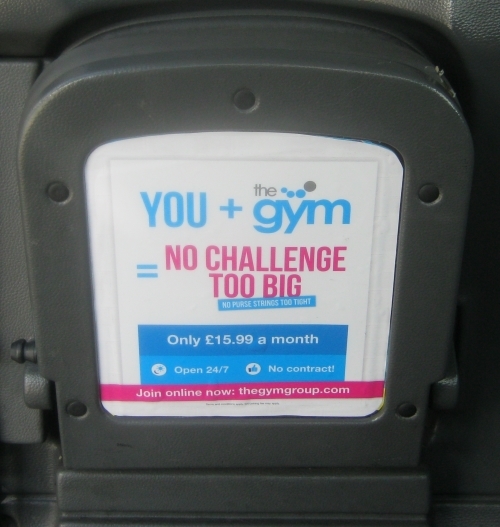 Contact us at Huge Media to find out how affordable Tip Seat Advertising can be for your business. We have fitting centres throughout the country and can run Taxi Advertising campaigns with guaranteed results. We work with many major brands and also direct with marketing and PR agencies to make sure your campaigns are successful.